Building and designing a yacht to smash world speed sailing records requires a big budget, lateral thinking and a lot of Bols. Steve Raea profiles the new shape of speed. At 93 feet, the British-designed, Australian-built and Kiwi-crewed super-maxi Bols stands out as a monolith of design technology. It is a creation that challenges every facet of thinking and sets a new benchmark in the world of Formula One yachting. If, from casual observation, the yacht looks like any modern run-of-the-mill maxi then take a closer look because the more you do, the more you see. Bols is the brainchild of Christchurch-based skipper and project manager Gordon Kay and British high-performance yacht designer Hugh Welbourn. 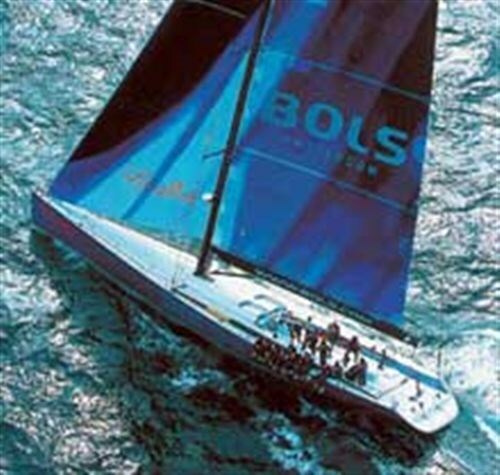 Unlike modern maxis Wild Thing and Alfa Romeo, Bols has not been designed to dovetail into the constraints of a design rule and will therefore be excluded from competing in the annual Sydney-Hobart classic. The Sydney-Hobart is limited to boats with an IRC rating of less than 1.61. Under the IRC rating, Bols measures 1.745, which gives some indication of the yacht's theoretical performance. Why, then, build a yacht that will be excluded from what is arguably the world's premiere ocean race? The answer is simple. The Sydney-Hobart is the only ocean race that limits the performance of yachts. And, as Kay points out, what is the benefit of building a yacht that is effectively designed to race just one race? Bols is built purely to break world speed sailing records and compete in key European events such as the Round Gotland race, the Fastnet, the Maxi Worlds and possibly the monohull division of The Race - a no-holds-barred thrash around the planet. Kay says Bols is easily capable of demolishing the existing 24-hour monohull speed record (484nm) set by John Kosteci in the German entry Illbruck in last year's Volvo Round the World Race. In the right conditions, he says, Bols could break the 500-mile day. And he suggests 400-mile days and 250-mile half-days will be a regular occurrence. Bols measures 28.3m (93ft) long with a beam of 6m and a 23-tonne displacement in what Kay calls a light mode. Above deck, Bols sports a 34m in-line carbon-fibre mast built by Southern Spars in Auckland. The standing rigging is of PBO, a synthetic rope-like material that has reduced weight aloft by about 350kg over conventional stainless steel rod rigging. 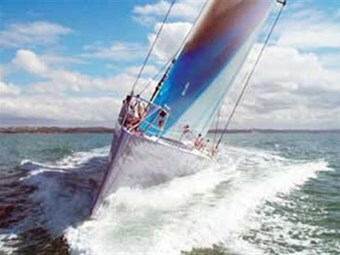 The sails are from Doyle's Auckland loft and have been manufactured from carbon using 4D moulding technology. It has a fixed keel and a deep single rudder despite having twin wheels. The hull shape is wide at the stern and not dissimilar in profile to a modern Open 60 race yacht. British designer Hugh Welbourn describes Bols as being three different boats in terms of under-water hull shape. He says the off-axis profile generates a lot of power like an Open 60 but, when upright, retains a very low wetted surface area. The hull is the product of extensive tank testing at Southampton's Woolfson Unit, a facility that allowed Welbourn to trial a number of radical appendages. One of the most significant developments and a possible first in modern yacht design is the addition of hydraulic trim tabs on the transom scoop. These look and operate in much the same way as conventional trim tabs fitted to everyday powerboats and are principally designed to keep the bow down when planing. Welbourn says that with trim on, the bow goes down, which allows the yacht to get back into a more efficient dynamic surfing mode. As the net resistance of the boat reduces it effectively increases the waterline length. Welbourn says tank testing indicated that the trim tabs will come into their own once the boat pushes through 16 knots and will improve the faster the boat sails. He says the use of tabs will, however, be dependent on sea conditions. "There are times when the boat is trying to get up and surf and you want something to hold the bow down, but at other times you want the bow to come up. It is always a fine balance. If you have awful sea conditions, you might want the bow to ride a bit higher to give better control through the seas, but if there are long regular seas you can flatten it down and let the boat run." Similarly, the trim tabs can be used to balance the helm in awkward quartering seas by fully deploying one tab and partially deploying the other. Welbourn is convinced of their benefits. "I think people will be smacking themselves in the head saying, 'Why didn't we do that years ago?' In my mind it is totally logical and I can't understand why people haven't done it before." Another go-fast feature below the waterline is the fold-up prop shaft. The prop shaft has a single pin joint with the end of the shaft attached to a curved P bracket that drops down when the engine is required. When the prop is not required it is feathered, turned to an index position and pulled up inside the boat, a door closed behind it for added structural integrity. Bols' structural engineering was designed by High Modulus in Hamble and built-in carbon fibre with a mixture of PVC and Airex cores in the hull and Nomex in the deck. 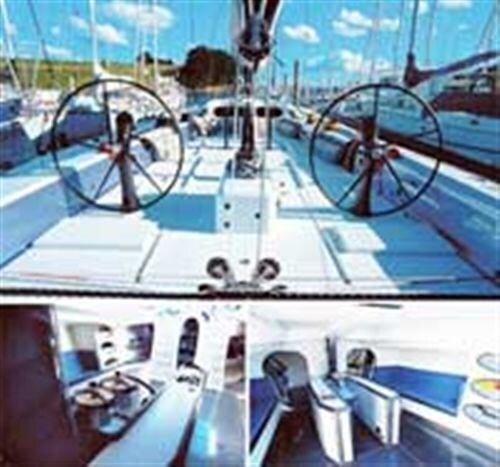 The boat is built to Category O requirements and features two full bulkheads forward and two aft. In the bow there are large 450mm-deep longitudinal stringers while aft, either side of the engine compartment, are two full-height centerline longitudinal stringers. Bols was built at Peter and Sari Ullrich's new Boatspeed factory at Gosford just outside Sydney, a facility with a new 127ft x 24ft x 36ft oven. She can carry up to 4.8 tonnes of water ballast in twin tanks on each side, but Welbourn says it is unlikely that the boat will sail with more than four tonnes. Any more, he says, would put the boat over the top end of its displacement range and over load the gear. The leeward ballast tanks are gravity fed from 12-inch pipes prior to tacking. The tanks can be filled from empty in around two minutes with two large pumps located in the engine compartment beneath the cockpit. Due to its round-the-world capability and its speed, structure, build and gear, the new Bols is more substantial than other new-generation maxis. While the boat is expected to make 11-12 knots VMG upwind, downwind the rudder is engineered to cope with full lock at 35 knots. "You'll be well over 30 knots in a nice set of waves and regularly high 20s," says Welbourn. "It is phenomenal when you start doing the numbers. But it produces its own set of problems. So there are trade offs all the way down the line." Bols recently underwent trials on Auckland's Hauraki Gulf before sailing to Christchurch last month for a tilt at the 24-hour monohull speed record. The attempt eventually came unstuck when the yacht lost both its wheels in far from ideal conditions, forcing Kay and his Kiwi crew to abandon the attempt. Despite the disappointment, Bols reached target speeds of 22 knots with bursts to 30 knots in 35-knot winds. Bols was shipped to Europe last month where she will begin her racing career with a start in the Round Gotland Race.